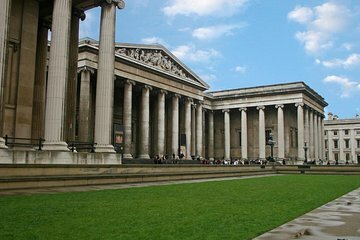 Visit the British Museum on this 3-hour private tour. With your own art historian guide, explore the British Museum, one of the world’s greatest historical treasure troves, as you wish. As British Museum tours go, it’s ideal for getting a personalized perspective on the collections and highlights such as the Parthenon sculptures. Meet your art historian guide near the British Museum and go inside to start your private tour. When you book, list any special interests you have, such as art, history or culture, so your private guide can prepare your personalized tour in advance. One of the world’s premier museums — on a par with Paris’ Louvre and New York’s Metropolitan museum — this world-famous institution houses a vast collection of historical artifacts and art across more than 70 galleries. With your guide providing enlightening commentary throughout, stroll around to discover some of the museum’s highlights. View treasures such as the Parthenon frieze from the Acropolis at Athens; the fabled Rosetta Stone and Egyptian mummies; and check out more of the artifacts and sections as you wish. A terrific day with a great tour guide! Such a big museum but one that needed to have someone as knowledgeable as our guide to weave through the exhibits to focus on what's important to our family! La visita estuvo bien, recorrimos lo principal del museo. La guia no fue de lo mejor y sobretodo con los niños. Hemos tenido experiencias mucho mejores y mas con lo que es el British Museum. Our guide was most knowledgeable on all the arttifacts and exhibits we reviewed in the museum. He answered virtually every question we posed in depth. We did take issue with an 18 minute delay when he showed up late with a brusk , sorry for the delay and we were off. He also literally left us behind several times because our senior bodies could not keep up the pace. Overall, we had a great time, marred only by the Incidents cited . This place is AWESOME. How else to describe the amazing privilege to stand next to human artifacts cutting stones used on an axe or the like that date back 400,000 that's right, four hundred thousand years before Christ. Or to be able to take a selfie next to a bust of Julius Ceasar! The antiquities portion of this museum is incomparable. Full disclosure: Betty did not enjoy TBM as much as Jim. Excellent guide for the British Museum. Rosa took extra time in explaining the history to our12 year old. She was very patient and knowledgeable!! We all learned a great deal! Good tour. Guide was organized and knowledgeable. Would have given 5 stars, however he seemed a little detached. I have had other guides who we're much more personable. Excellent tour! I highly recommend getting a tour guide. Tour seems pricey, especially after you meet your diminutive guide with her heavy accent, but she is a treasure. She quickly found out what the three of us were interested in, and made sure we saw it, told us stories about it, AND ensured we saw the prize of the museum. Wonderful experience. This was everything we could have hoped for. The guide was outstanding allowing us to see and understand things we might not have otherwise. Well worth the price. I posted this review already. It was an excellent tour. Excellent guide and I look forward to trying the service again! Jeff Amos.